Ordering a cup of coffee in a traditional Italian café at a busy time of day is a little daunting for a visitor. Firstly, the place will be chaotic, full of jostling people knocking back espresso in one gulp. Receipts and coins fly everywhere, and at the centre of it all, there’s a gleaming espresso machine, run by a barista who moves like a dancer between the machine and his counter. It may look like chaos, but there’s a system at the heart of it all, and the system works like clockwork. The prospective coffee drinker goes to the cash till, places his or her order, pays for it and gets a receipt – the magic ticket. The receipt is then jostled through the crowd and placed on the counter for the barista to pick up. He makes the coffee and exchanges it for the receipt. It’s all beautifully simple, and works because everybody knows exactly what they should do, and when. It’s decades of tradition and culture distilled down into a simple everyday transaction. There’s little shortage of good coffee in Rome, but the best of the bunch is possibly Sant’ Eustachio Il Caffe, an eighty year old coffee shop near to Plaza Navona and the Pantheon. 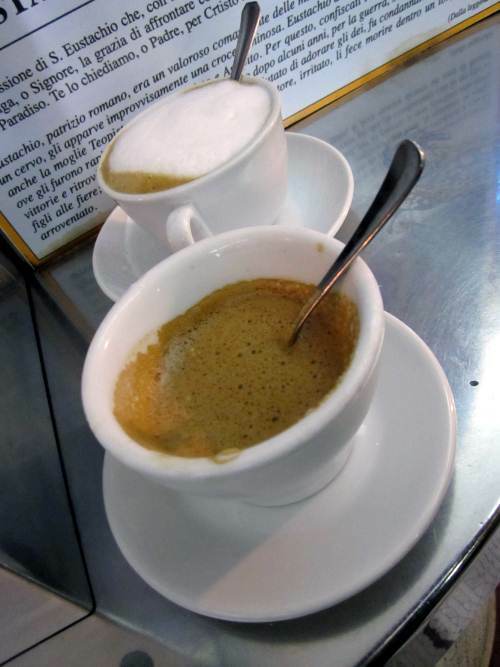 Sant’ Eustachio’s signature cup is the gran caffe, a larger espresso served very sweet. The coffee is rich and thick, almost syrupy, and it smells earthy and robust. There’s a thick crema on top. It’s so far removed from the espresso on offer at the big American coffee chains we’re so used to as to be unimaginable. For this, you pay 1.10 Euros for a single espresso as opposed to the 80 cents or so at most other places, but the beans are slow roasted over wood on the premises to an exact specification. The wood adds a distinct flavour and smokiness to the blend that’s definitely worth a few extra cents. Sant’ Eustachio Il Caffe is one of the best, if not the best. And the worst? Try, or rather don’t try, Caffe Greco on Via de Condotti – cold coffee, overpriced. We sat down which immediately sends the price rocketing, and admittedly, it’s on the same road as Prada, but five Euros for a tepid espresso and seven for a cappuccino? Caffe Greco is famous for being frequented by luminaries such as Keats, Byron and Casanova over the years. History does not record what Casanova made of the espresso. Very precise and accurate Richard. I often wondered how that system would be met by the public here,and flirted with the idea of introducing it in Leeds. True, but Italians don't call it an espresso. It is "un caffé" (like the geographical place). Un (caffé) macchiato; un caffé lungo; un caffé doppio. Etc. Also I take issue with Alex: the home of the caffé is Naples, with its lever coffee machines. The woman who runs the F&F coffee truck in Park Square in Leeds has one and her coffee is ace. …:) A little read about Mr Faema and Mr Gaggia of Milano,may give you some different data to come to your conclusion of where the birthplace of the espresso machine really is. However,this is brilliant,you must really be an Italian at heart as you have taken on the most common regional sport of all…'We invented this..'. 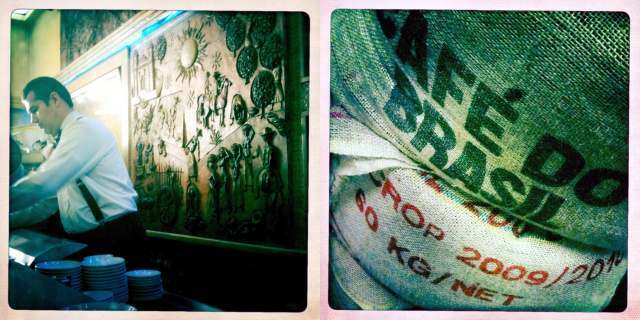 "Napolitani still make the best coffee. And pizza." Pizza Formula Uno in Rome make the best pizza. Like very large, thin bread crisps with soft, delightful toppings. When ever i find a coffee shop in Italy, I always try to avoid the "must visit" places – those linked to past stars or current hot spots. Likewise, I thought the coffee in Caffe Greco was rubbish compared to one opposite the McDonalds near the Spanish Steps. The best, are the ones that are busy with people in suits from 7am to early afternoon – if you also see a constant flurry of people carrying trays, with tinfoil covered paper cups – that is another sure fire way of finding a local favourite amongst the people that work in that area. The ordering system caught me out in a worker's restaurant. Took ages until someone came up to me and pointed me in the right direction. Since I was in northern Italy, I feel as though I was in a different country. We would stroll into a little cafe, order due cappuccini, take them outside to a table on the sidewalk and sit for as long as we liked, enjoying the wonderfulness of the country. The most "business" we saw was old women banging hall rugs over balcony railings.